All these years later, the Christian community of Kandhamal, which falls under the Archdiocese of Bhubaneswar is still waiting for justice. The attacks reduced more than 300 churches and almost 6000 Christian homes to ashes, rendering more than 50,000 people homeless. They began refugees hiding out in the forest. Yet, the Christian faith stood out shining amidst the rubble of burned out churches and Christian houses. While more than 100 Christians became martyrs for their faith, hundreds of others were fortunate to survive after they were brutally tortured for refusing to renounce their faith. They had been targeted just for their identity. The assailants’ goal was to force the Christians to give up their faith and embrace Hinduism. It all began with the gruesome murder on Aug. 23, 2008, of a local swami, a leader of the Vishna Hindu Parishad of Kandhamal District. The fundamentalist Hindu groups used the killing as an excuse to attack Christians. The local community utterly failed to protect the lives and property of their Christian neighbors. In the end, the victims who survived, homeless, became refugees in their own land, housed in relief camps set up by the government. 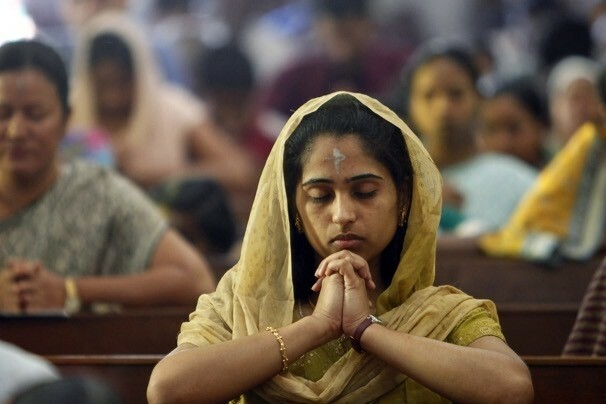 All in all, attacks on Christians continued for a full two months, until, finally, the federal government and the Supreme Court of India responded to the inability of the state government to protect the Christians . This was my experience: on the afternoon of Aug. 24, 2008, hundreds of people suddenly came into the compound of the Diyyajyoti Pastoral Center, home to facilities to train the laity. Seeing the crowd rushing in, my assistant priest, a woman religious and I jumped over the compound wall and escaped into the nearby forest. We hid there until 10.30PM,. We could see our home going up in flames. The mob broke open all the doors and windows, thinking we were hiding inside. That night, under the cover of darkness, the Sister and I went to the home of a Hindu gentleman. He was kind enough to give us food and shelter, putting himself and his family at great risk. My assistant priest found shelter at his brother’s house. The next day, Aug. 25, a group of some 50 people came back to the area, shouting slogans against Christians. Seeing them armed with sticks, knives, axes and other village weapons, our host got nervous and asked me to leave. He did allow the Sister to stay. The best he could offer me was his outhouse, where I hid under a table. But the crowd came up and broke open the door with an axe. I was pulled out and beaten with sticks and iron rods. I sustained injuries on top of my head, my forehead and shoulder. Immediately, Sister was pulled out of the home as well. Both of us were dragged over to the nearby archdiocesan social service center, which had been attacked the previous day. There, they tore of Sister’s clothes and raped her. When I tried to prevent the men from attacking her I was taken outside and doused in gasoline. Someone took out a box of matches. Seeing that, I said my last prayers, thinking my end had come. I was made to kneel on the road before the crowd. They brought out Sister, too, and we were made to march to the nearby marketplace, less than a quarter of a mile away. We had no choice but to obey orders. A police car approached—but failed to stop; no one came to our rescue. Policemen were standing along the road as mute spectators. I asked them for help, but got beat up instead by the crowd. Sister sat herself between two officers on a bench, but they did not thing and the mob pulled her back onto the road. At the marketplace, we were made to sit down on a concrete bench along the roadside and a man shouted at us: “from today on, you will say Ram, Ram only.” It is the name of a Hindu God. A big pile of tires was set on fire. We expected to be burned alive. But the worst thing did not happen. The good Lord has His way. That is all I can say. Next, we were taken to a police station. We were made to sit on the floor. One of our attackers sat in a chair nearby. That night we were transferred to the main police headquarters where we spent the night. The next day, Aug. 26, 2014, police transferred us by bus to Bhubaneswar, the state capital. We stopped at the Archbishop’s House. But soon both us were taken out of state for medical treatment. Looking back on all that happened, I thank God for giving both of us a fresh lease on life. We harbor no anger or bitterness toward those people who attacked and maltreated us. I only hope and pray that peace and justice may come to Kandhamal and that people can live there without religious discrimination. Most of the Christians in Kandhamal belong to the so-called scheduled castes. They are dalits, the lowest caste in the traditional Hindu hierarchy and they have long been discriminated against in India. But unlike Buddhist and Hindu dalits, Christian dalits—like their Muslim counterparts—are not receiving any government benefits, which is contrary to the Indian Constitution. Nonetheless, the local Christian community has made remarkable progress in every sphere of life, particularly when it comes to education. Christians are claiming their rightful place in society, unwilling to put up any longer with religious and social discrimination. In fact, the local Church runs a number of programs that boost human development—programs that are open to anyone, without any discrimination based on caste or creed. That is the Christian way!